Both of Tennessee’s secondary coaching positions are now vacant after the news that was reported today. According to a report from Volquest, Tennessee head coach Jeremy Pruitt has relieved cornerbacks coach Terry Fair of his duties at UT. Fair was hired on last season to be Pruitt’s cornerbacks coach, though Pruitt himself is a cornerbacks coach by trade and was seen often times at practice working with that specific unit. Per the report, Fair was offered an off-field role to stay at Tennessee, but he declined. Now, he won’t be returning for the 2019 season. 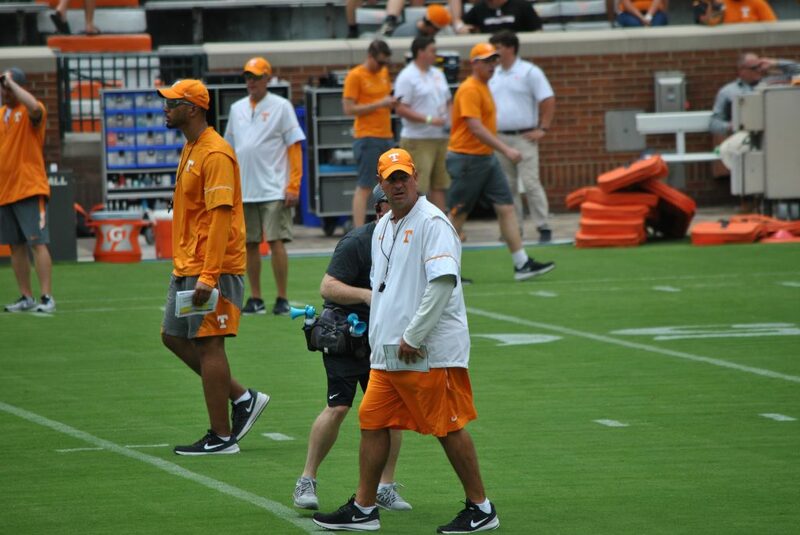 Fair isn’t the only secondary coach who won’t be returning to Tennessee next season, though. Safeties coach and special teams coordinator Charles Kelly left his position with the Vols earlier this offseason to go coach at Alabama in a similar capacity. Kelly’s spot was replaced by Tee Martin on the offensive side of the ball. Fair played for Tennessee as a defensive back from 1994-97 and was an All-American and All-SEC performer during the 1997 season. He was a first-round draft pick in the 1998 NFL Draft and played in the NFL for eight seasons. He was a defensive quality control coach for Tennessee from 2013-14, then he left his alma mater to go join Mike Bobo’s staff at Colorado State to coach the secondary. Pruitt hired Fair last offseason, and Fair was signed to a two-year, $250,000 contract. Tennessee will still owe him the remainder of the money on his two-year deal. Fair was the second-lowest paid coach on UT’s staff in 2018. Only tight ends coach Brian Niedermeyer made less, bringing in $205,000 last season. Niedermeyer was just named the National Recruiter of the Year by 247Sports for the 2019 cycle, though, so a raise is in order for him. The former Vol was credited on 247Sports as being the primary recruiter for three-star cornerback Warren Burrell, three-star defensive tackle Elijah Simmons, three-star cornerback Brandon Davis, and three-star JUCO cornerback Kenneth George Jr in the 2019 and 2018 classes. He was also the secondary recruiter for four-star cornerback Tyus Fields, four-star athlete Bryce Thompson, and three-star cornerback Kenney Solomon.